Can you hear the sizzling temptation of potato slices in a hot skillet? And what is that delicious smell? 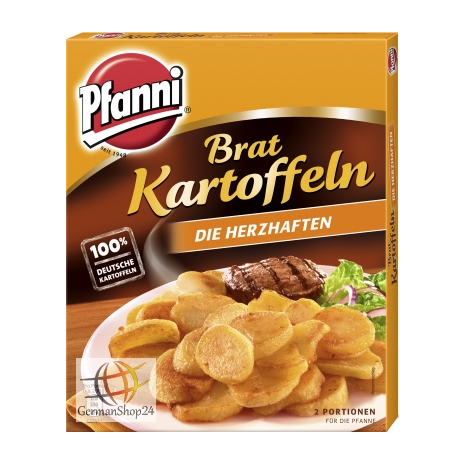 Pfanni fried potatoes are quick and easy to prepare and are a true temptation for all potato lovers. 400g / 14.10 oz NET. WT. 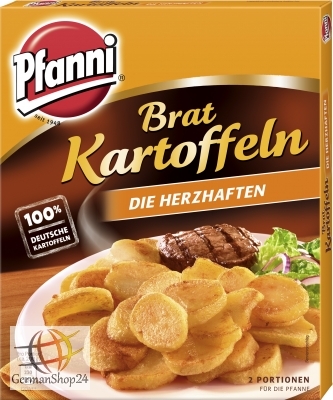 93% of potatoes, onions, vegetable oil, salt, yeast extract, sugar, spices (with celery seed), spice extracts. 93% Kartoffeln, Zwiebeln, pflanzliches Öl, Speisesalz, Hefeextrakt, Zucker, Gewürze (mit Selleriesaat), Gewürzextrakte.